Grout is the hard filler substance between tiles that contributes both stability and aesthetics to your floor or walls. Unlike the mortar between bricks that actually cements the bricks together and provides structural strength, grout functions mainly as a space-filler to prevent shifting of tiles as well as a sealant to inhibit infiltration of moisture between and beneath tiles. Standard grout is typically blended with water into a pourable mixture that readily flows into the gaps between tiles and cures hard in a day or so. In addition to filling spaces, grout is also used to adjust for small variations in the dimensions of individual tiles and the thickness of the tiles, as well as inconsistencies in the substrate below. The color of grout is also an important factor to complement the visual appeal of the tiles. While there’s no set standard for the width of grout lines between tiles, certain commonly accepted practices prevail. For small-format tiles up to 8 inches by 8 inches, the spaces between tiles will normally be either 1/32 or 1/16 inch. Regular format tiles from 12 x 12 inches up to 16 x 16 inches will be spaced with 1/8 inch grout lines. Tiles larger than 16 x 16 actually present a more uniform appearance with narrower grout lines of 1/16 inch. Generally speaking, most contractors prefer not to exceed 3/16 inch with most types of tile. The exception is heavy quarry materials such as slate, which sometimes utilize grout lines up to and even exceeding one inch. The chemistry and technology of grout is continuously advancing as mixtures are refined and improved with various additives. Still, the available types of grout can be broadly divided into these three varieties in widespread use. This common type is usually utilized for narrower grout lines such as 1/32 or 1/16 inch. Those gaps are too small to permit the use of sanded grout, which includes granules of sand that don’t penetrate well into very narrow openings. 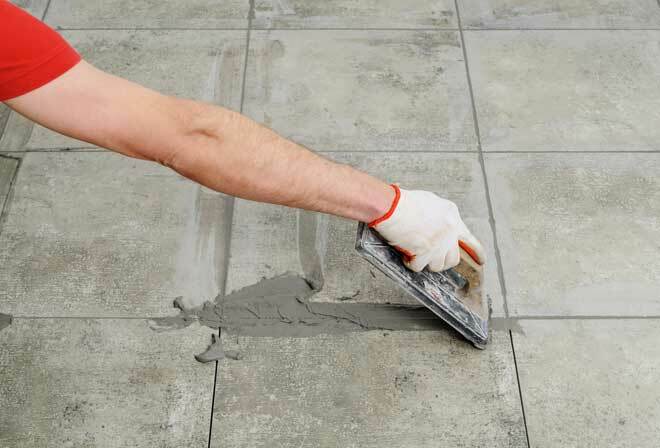 Non-sanded cement grout is a mixture of Portland cement and is available in a basic color of gray or off-white. Addition of colorants mixed into the grout can create a wide variety of additional colors. Non-sanded grout is always recommended for certain types of polished stone—granite and marble are good examples—that might easily be scratched during the grouting process by the sand content of sanded grout. This variety is a mixture of Portland cement and very fine sand graded for this specific use. While a 1:1 mixture is utilized for joints up to 1/8 inch, the proportion of sand is increased for wider joints. Sand content is important for wide joints because the granules of sand add bulk to the mixture and help bond the grout cement together, as well as improve adherence to the tile. Sand also reduces shrinkage of the grout that would otherwise occur in wider grout lines. This, in turn, makes cracking and “loose” grout less likely. The sand and cement may be mixed on-site or purchased as a pre-mixed sack with colorant and other additives. Polymers that are now mixed with both types of sanded cement grout increase hydration of the cement and result in a harder grout surface. They also prevent a mottled appearance and the formation of white haze on the grout lines after it dries. Both non-sanded and sanded cement grout can be considered water-resistant but definitely not waterproof. Absorption of liquids that cause staining is a potential drawback of unsealed cement grouts. Moisture penetration may also trigger mildew growth. Therefore, it is standard procedure to seal cement grout lines after the new grout has dried for a few days using a commercially available sealant. Cement grout sealants come in two types: membrane and penetrating. The membrane variety forms a thin top seal but doesn’t go deep into the grout. Penetrating sealants are generally preferable because they soak into the pores of the grout and don’t discolor or haze over with time. For maximum protection against stains and mildew, cement grout lines should be re-sealed once a year—more often in high traffic areas. It’s an easy DIY job that can be done with a can of sealant and a good supply of Q-tips. Where high traffic, water exposure and wear and tear are an issue, epoxy grout may be the answer. Like most forms of epoxy, the formula consists of two or three components—resin and hardener plus colorant—that must be mixed to a specific proportion and then applied in a timely manner. Epoxy offers superior hardness (it is frequently harder than the surface of the tile itself) and durability and is impervious to water and staining. It also resists growth of bacteria like mildew. Early versions of epoxy were difficult to adapt to grout applications because the formula hardened quickly after mixing components. Often it was problematic to apply the mixture fast enough before it would begin to cure. Today’s new generation of epoxy grouts harden more slowly to allow more time for application. Plus, the formula contains detergents that permit clean-up with water, which was not possible with earlier formulations. Epoxy grout is typically available in both non-sanded and sanded formulation for use according to the width of the grout line. The primary downside of epoxy grout is the price. The cost of epoxy grout can be as much as five times the cost of standard cement grout. Also, tile installers generally impose a higher labor cost for installing tile with epoxy grout versus cement. The process is more complex and demanding and clean-up is also more time consuming. Some tile installers do not offer epoxy grout as an option at all. However, when the factor of very low long-term maintenance is considered—epoxy grout can often simply be wiped clean and annual re-sealing is not required—the cost is attractive to many homeowners, especially when limited to certain areas of the home. Epoxy is often chosen in demanding, high-traffic areas prone to water exposure and staining such as kitchens and bathrooms, while tile in other parts of the home may be grouted with standard cement grout.